Real-time : All the systems that I create are modeled to capture relevant information as it takes place. Health : My systems are geared towards finding technological solutions, or providing better toolkits for understanding underlying phenomena, of health related problems. Mobile : I like my systems to be implemented in a way such that people can take them along with themselves. I am extremely fortunate to have Octav Chipara as my advisor. Octav heads the Mobile Systems Laboratory (MSL) at the University of Iowa's Computer Science Department. like listening effort, speech perception etc. and objective measures like SNR. positive effects, if any exist, of adding information from other users. Show the prevalence of different contexts, highlight the importance associated with them. Propose a method of combining outcome measures. Show that it is possible to discriminate between good and bad outcome scores with an accuracy of 78%. Present CSense, a high rate robust stream processing toolkit. Conduct static analysis on the stream flow graphs of sensing applications to optimize frame exchange across components. Show that our flow analysis reduces CPU utilization by as much as 45% compared to the baseline. 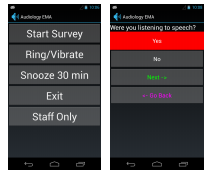 Traditionally, hearing aid performance measurements are conducted in controlled lab settings. Present AudioSense, a system to capture contexts in real-time and in-situ. Show that AudioSense is robust against network problems and performs with a reliability of 100% in test conditions.